The heralded 1776 tech incubator and seed fund is moving into Crystal City, bringing tech bonafides and millions of dollars with it. Today, on the roof of 220 20th Street S., Gov. 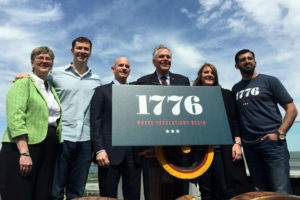 Terry McAuliffe, Arlington County Board Chair Mary Hynes, Vornado CEO Mitchell Shear, 1776 co-founders Evan Burfield and Donna Harris and former Disruption Corporation CEO, and now 1776 Managing Director, Paul Singh joined forces to make the announcement. As part of its deal to expand in Crystal City, 1776 acquired Singh’s Disruption Corporation, a combination of a venture fund and financial advisory firm. Disruption’s headquarters on the 10th floor of 2231 Crystal Drive will be 1776’s base of operations in Arlington, according to Crystal City Business Improvement District Angela Fox. “One of the beauties of Crystal City is there is so much space to expand, and if they do well, that’s certainly the thinking in all of this,” Fox told ARLnow.com this afternoon. Earlier this week, 1776 announced a partnership with Montgomery County, and the incubator’s announcement today makes it one of the, if not the premier, dominant forces in the D.C. area technology space. In 1776’s new headquarters, it will already have member companies like Bloompop, Power Supply and Onomono Media. 1776 also hosts the Challenge Festival, an international, weeklong festival aimed at bringing together entrepreneurs in the energy, education, health and transportation sectors. The company anticipates more than 10,000 industry members will attend, and the opening party will be in Crystal City, at 2121 Crystal Drive, on May 8 from 7:00-11:00 p.m. The incubator hopes to leverage the still-significant hub of government agencies and contractors in Crystal City, as well as the close proximity to the Pentagon, in its latest expansion.